Odontoglossum orchids are some of the showier flowers of the orchid family. Derived from the Greek words odon (tooth) and glossa (tongue), for the tooth-like calluses on the lip, the first of this genus was described in 1816 by Karl Sigismund Kunth. Odontoglossum orchids are fragrant and produce blossoms with ruffled sepals and petals. Colors vary widely among the over 100 species and include white, yellow, brown, red, purple and some color blends. Well-known examples of this species include the Odontoglossum grande (Tiger Orchid), whose nickname refers to the color and striping of the blossom. Another member of this genus is the Odontoglossum pulchellum, nicknamed the Lily-of-the-Valley Orchid because of its resemblance to that flower in both bloom and fragrance. The native habitat of this genus is the humid cloud forest in Central and South America, with most species enjoying the higher elevations of the Andes Mountains. Odontoglossum orchids prefer cool to cold growing temperatures. Day time temperatures should be less than 80 degrees Fahrenheit, with night time temperatures of 55 to 60 degrees. If these orchids are placed in temperatures that are too warm, the flowers will not open completely. 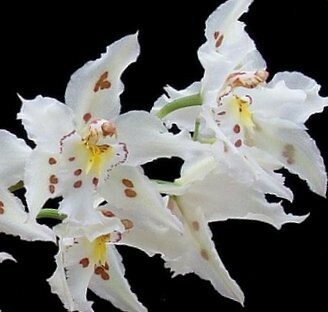 Odontoglossum orchids are epiphytes and produce compact, ovoid pseudobulbs with one to three narrow, apical leaves. The inflorescence sprouts from the pseudobulb base and produces stems ranging from a few inches to 3 or 4 feet long. Depending on the species, one of these stems can carry anywhere from 20 to 150 blossoms. Blossom sizes range from one inch across to over six inches in diameter. The ruffled sepals of these flowers are spreading and the lip stands erect or parallel to the column. Most Odontoglossum orchids grow best when the roots are tightly confined. As a result, you may need to use a smaller pot than you would with other types of orchids. Place a little growing medium (usually fine or medium fir bark) in the bottom of the pot, then add the plant and gently spread the roots over the medium. Add more medium, press it firmly around the roots, and then finish filling the pot. Odontoglossum orchids love high humidity, preferably between 55 and 75%. If daytime temperatures increase, increase the humidity accordingly. If you use a humidity tray, do not let the bottom of the pot stand in the water, because these orchids don’t like to get their feet wet. Instead, place the pot on pebbles and keep the water level below the pebbles. Water regularly, preferably in the morning, so the leaves can dry by nightfall. Be sure never to use artificially softened water, either for watering or for misting, because this genus of orchids is water sensitive. Move the air as much as possible without creating cold drafts. Low light, around 1,000 to 1,500 foot-candles is sufficient for Odontoglossum orchids. To know if your plant is getting enough light, keep an eye on the leaves. Bright green leaves indicate the right amount of light. If the leaves are dark green, the plant isn’t getting enough light. Conversely, if the leaves appear reddish, the orchid is in too much light. For enthusiasts living in temperature, frost-free regions, some species of Odontoglossum orchids can be grown outside under a protective patio covering.